The Prompt Understanding of Measure Words covers 157 common measure words in the following four categories: measure words for nouns, measure words for verbs, double-function measure words and compound measure words. The basic meanings of each measure word are followed by usage explanations and English translations. Typical examples of collocations, phrases, expressions used in special situations, or notes are arranged according to the needs of various measure words. With b&w illustrations. A well-known chinese folktale is retold here within the limits of an elementary 300 character vocabulary. Yale and Pinyin romanization with Traditional characters. 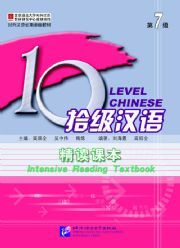 An excellent text for beginning Chinese students. """Delightfully engaging ... this book contains a wealth of hard facts about Chinese."" --Canadian Journal of Linguistics ""DeFrancis's book is first rate. It entertains. It teaches. It demystifies. It counteracts popular ignorance as well as sophisticated (cocktail party) ignorance. Who could ask for anything more? There is no other book like it. ... It is one of a kind, a first, and I would not only buy it but I would recommend it to friends and colleagues, many of whom are visiting China now and are adding 'two-week-expert' ignorance to the two kinds that existed before. This is a book for everyone."" --Joshua A. Fishman, research professor of social sciences, Yeshiva University, New York ""Professor De Francis has produced a work of great effectiveness that should appeal to a wide-ranging audience. It is at once instructive and entertaining. While being delighted by the flair of his novel approach, the reader will also be led to ponder on some of the most fundamental problems concerning the relations between written languages and spoken languages. Specifically, he will be served a variety of information on the languages of East Asia, not as dry pedantic facts, but as appealing tidbits that whet the intellectual appetite. The expert will find much to reflect on in this book, for Professor DeFrancis takes nothing for granted."" --William S.Y. Wang, professor of linguistics, University of California at Berkeley"
Lee Cooper is the author of several popular and successful books on language arts and folklore for children, including Fun with Spanish, Fun with French, Fun with Italian, and Fun with German. An award-winning writer, Lee Cooper is listed in Who’s Who of American Women, Who’s Who in the South and Southwest, Contemporary Authors, and the Directory of British and American Writers. Her home is in Fredericksburg, Virginia. 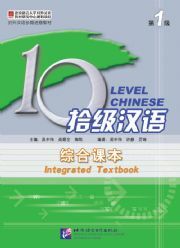 Ten Level Chinese is a Chinese textbook series compiled for the international students taking long-term Chinese courses in China. Considering the different levels of the students, the different native language they speak, and the large amount of learning hours per week, the series is specially designed to help the Chinese beginners to develop their Chinese skills comprehensively and to cultivate their language and communication ability. The whole series is arranged based on the scientific classification of the learners’ language levels. In each level, there is paralleling training of four skills. 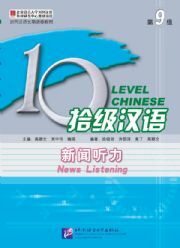 Altogether there are 10 levels: the Threshold leads the learners into the world of Chinese in a relaxing manner; Levels 1-4 are for the elementary stage, emphasizing integrated skills training with combination of listening and speaking; Levels 5-8 are for the intermediate stage, focusing on sub-skill training with separate listening, speaking, reading and writing courses; Levels 9-10 are for the advanced stage, containing courses in news listening, social issues, etc.